The Cracovian tradition of building nativity scenes modelled on the city’s stunning architecture has been included on the UNESCO Representative List of the Intangible Cultural Heritage of Humanity. The decision was confirmed at the committee meeting held on Thursday 29 November in Mauritius. It is Poland’s first entry on the List of Intangible Cultural Heritage. The full list includes over 400 traditions from around the world, such as Indian yoga, Cuban rumba, Portuguese Fado songs, Chinese calligraphy and the Mediterranean diet. The customs are now joined by Kraków’s nativity scenes. Although nativity scenes are made the world over, the Cracovian constructions are unique. The city gave rise to modelling nativity scenes on local architectural elements, such as Kraków’s mediaeval buildings and monuments. The tradition has been maintained since the 19th century. In the early days, they were portable puppet theatres whose creators – craftsmen living in suburbs and villages on the outskirts of the city – recreated the nativity scene at homes of wealthy Cracovians during the festive season. The oldest preserved nativity scene, made by Michał Ezenekier in the second half of the 19th century, is held in the collection of the Ethnographic Museum in Kraków. 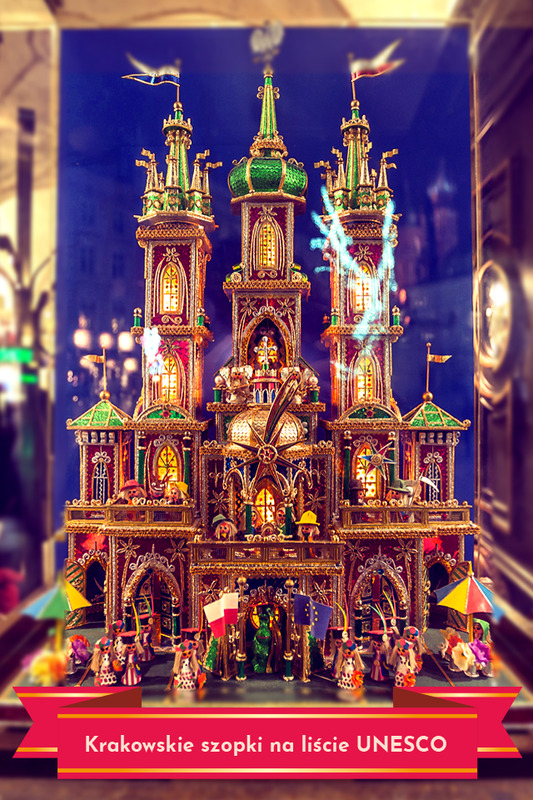 The competition for the most beautiful nativity scenes was initiated in 1937 by Dr. Jerzy Dobrzycki, director of the Municipal Art Propaganda Office. Ever since then, on the first Thursday of December, artisans bring their nativity scenes to the Rynek Główny and arrange them on the steps of the statue of Adam Mickiewicz. The constructions are assessed by a jury comprising historians, ethnographers, art historians, architects and artists. There are around 50 entrants in the adult category and a few hundred in the children’s and young people’s categories. This year, on Thursday 6 December, the Rynek Główny in Kraków hosts the 76th Nativity Scene Competition. After the midday hejnał bugle call, a festive pageant of artists passes around the Rynek Główny and onto the stage for the presentation. Winners in the adult category are announced at 2pm on Sunday 9 December at the Kupferhaus Auditorium at the Krzysztofory Palace (35 Rynek Główny). As usual, all entries are presented at the post-competition exhibition at Celestat (16 Lubicz Street), held between 10 December 2018 and 24 February 2019. The grand opening of the exhibition is held at 4pm on 9 December, coinciding with the switching on of the lights on the nativity scene at the Strzelecki Park. This winter, Historical Museum of the City of Kraków and the Kraków Festival Office have come together for the fourth time to bring nativity scenes beyond the museum walls: the campaign Around Nativity Scenes (6 December – 31 January) presents the beautiful constructions in windows and displays of shops, hotels and restaurants, in front of shopping centres, and in city parks and squares. This year we will see 41 constructions displayed throughout the city. Some are archival exhibits awarded during past competitions, while the remainder were commissioned especially for this year’s campaign and placed in illuminated cases. The high point of the campaign is the Walk Around Nativity Scenes, guided by Michał Niezabitowski, director of the Historical Museum of the City of Kraków, on 6 January 2019. We have also prepared a bilingual guide to the campaign, presenting the route around nativity scenes. This event is Kraków’s latest success in promoting cultural heritage, confirming the leading role played by our city in cultivating regional and national traditions and customs, bolstering and protecting Polish heritage and promoting it the world over.